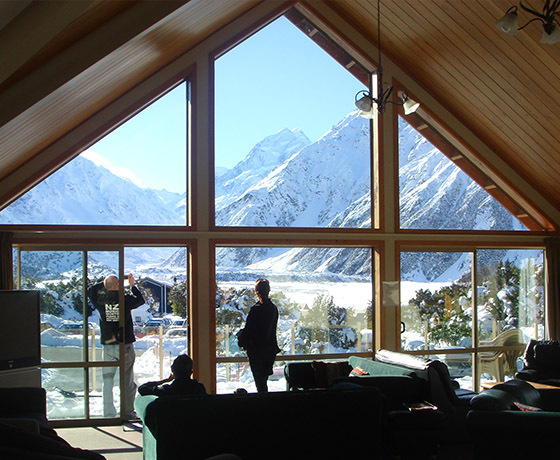 Aoraki/Mount Cook Alpine Lodge truly offers guests quality, uncrowded, self-catering accommodation right in the heart of Aoraki/Mount Cook Village. All rooms have ensuite facilities and most have spectacular views of Mount Cook and surrounding peaks and glaciers. The rooms are set up to cater for all budgets including family rooms, twin, queen and triple rooms and two fully self-contained rooms. 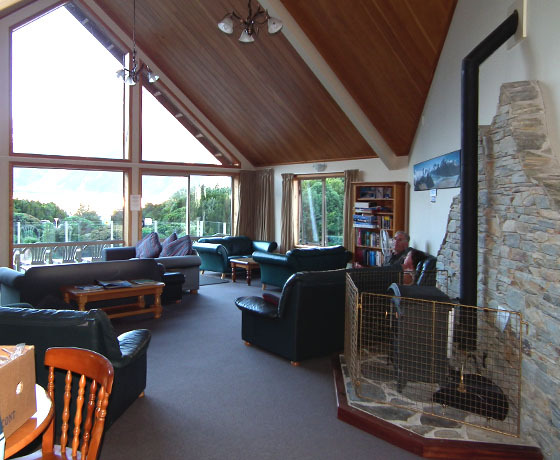 The guest lounge is the best place in Mount Cook to put your feet up and enjoy the mountains and glaciers. The views from this room are unbeatable and it has a cosy fire and lots of comfortable couches to relax in along with a large deck on which to enjoy the sun. One four bed bunkroom with ensuite and flat screen tv. Beds are made up, towels, soap etc. provided. This room does not have a view. Please note: This room is compact when having 4 adults in it. It is backpacker type room, so be prepared for bunks. Has one king size bed (or two single beds) plus a bunk set (in the same room) with ensuite and separate toilet, flat screen tv and tea/coffee making facilities. This room is rear facing and has no view. This room is ideal for Mum, Dad and two young children. Please note: this room is compact when having 4 adults in it. We recommend three adults at the most, without children. This room is on the ground floor. It has one double bed and one single bed, ensuite, tv, tea and coffee making facilities and superb mountain views including Mount Cook. Please note that this room is very compact if wanting to have more than two people in it. Has king size bed or two single beds, ensuite, tv, tea and coffee making facilities and superb mountain views including Mount Cook. Has one king size bed or two single beds. This is a larger room than other double rooms. 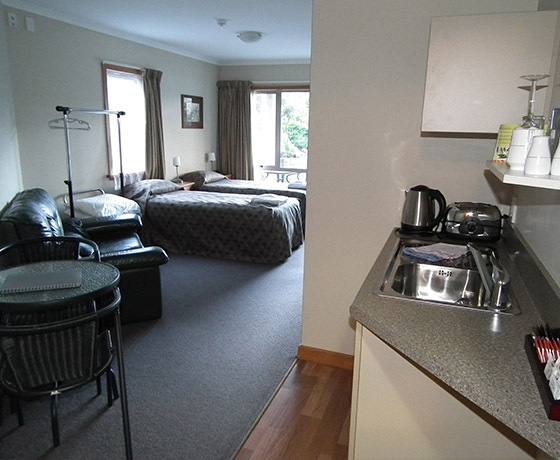 It is on the ground floor room and has superb mountain views, including Mount Cook. It has a patio door opening onto a covered deck. This room also has a pull out sofa bed for a third person. Linen and bedding will be provided for this at a charge of $25 per night. The sofa bed for the 3rd person can only be booked in combination with a king bed. Please be aware the room is compact when having three people in it. 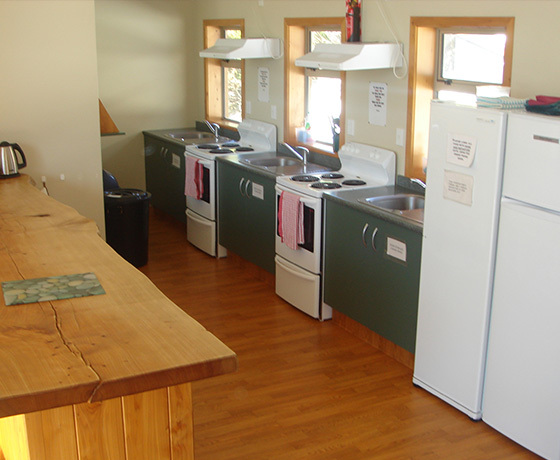 The kitchenette has a microwave, bar fridge, toaster, tea and coffee making facilities including a plunger coffee maker. We consider these to be the best rooms in the house. Has one double bed, ensuite, flat screen tv, tea/coffee making facilities. This room is rear facing and does not have a mountain view. This room is upstairs with awesome views. Has one king size bed (or two single beds) plus a bunk set (in the same room) with ensuite, flat screen tv and tea/coffee making facilities. Fabulous views including Mount Cook. This room is ideal for Mum, Dad and two young children. Please note: these rooms are compact when having 4 adults in them. We recommend three adults at the most, without children. Has king size bed or two single beds, ensuite, flat screen tv, tea and coffee making facilities and superb mountain views including Mount Cook. This room is upstairs with views superior to the ground floor. How to find Aoraki/Mount Cook Alpine Lodge? Turn right upon reaching Aoraki/Mount Cook Village, then take the first left. Drive another 300m to the top of the hill, and you will see Aoraki/Mount Cook Alpine Lodge, the two-storey building on your right.